More secrets and retcons come to light, as Scott Snyder and legendary artist Jim Cheung deliver an unforgettable tale of two unlikely friends and the price of a selfless sacrifice. Snyder himself has advertised these last three issues as the bookend to his first year on the title, as he makes his way into this next year’s initiative. Standing tall as DC’s flagship series, all due respect Batman, Snyder and team continue to push the envelope and explore new corners in a nearly century old universe. 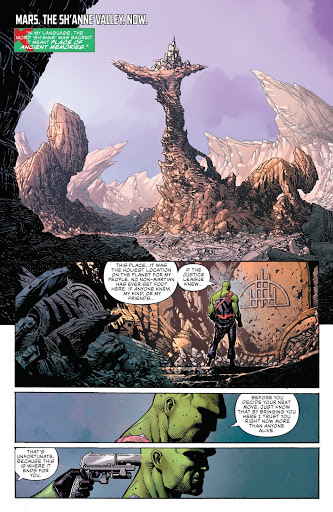 As Lex Luthor and the Martian Manhunter meeting in secret on Mars, J’onn seeks answers from Superman’s arch nemesis with questions of their potentially shared past. Focusing solely on the duo this time around and adding a layer of dichotomy to juxtapose between the two, plays hand in hand with the new revelations moving forward. Closing out this year with a heartfelt one shot, the ramifications are still to come as the duo and readers alike are taken into new territories in this next coming phase for the series. Long time Marvel exclusive artist, the legendary Jim Cheung returns for another full issue in this already legendary run. Cheung’s signature style works excellently for this issue in particular. Not only as a one-off story but playing with the dictomoty of the duo, even down to the visual similarities, fits right into Cheung's wheelhouse with his unmistakable style. Cheung continues to set the bar continually higher with his unmistakable pencil work, from the gorgeous main cover down to the last heart wrenching page. Tomeu Morey continues to as Cheung’s right hand elevating his pencils to a higher level and accentuating this issue with his beautiful colorwork. Snyder proves once again to have an endless trail of secrets up his sleeves. His ability to retcon a completely new aspect and relationship to two well established characters and manage to keep it completely organic and heartfelt, displays exactly why he was the perfect choice for this era of the title. With the scale solicited to only grow larger, Snyder and team will continue to prove to readers who the premiere superhero team truly is. Scotty Snyder and Jim Cheung continue to unravel an unforgettable tapestry as they take readers into the next phase of the title. 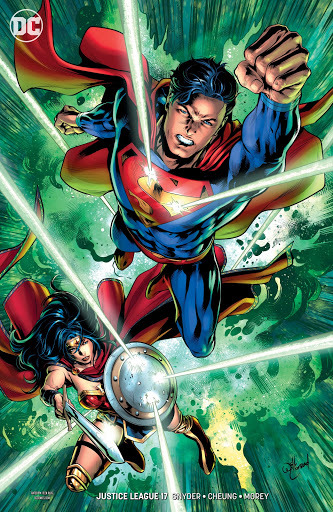 With 5th Dimensional counterparts, multiversal counterparts and 853rd century counterparts all around the corner, The Justice League (and Scott Snyder) have only just begun to take on these new and bright frontiers.